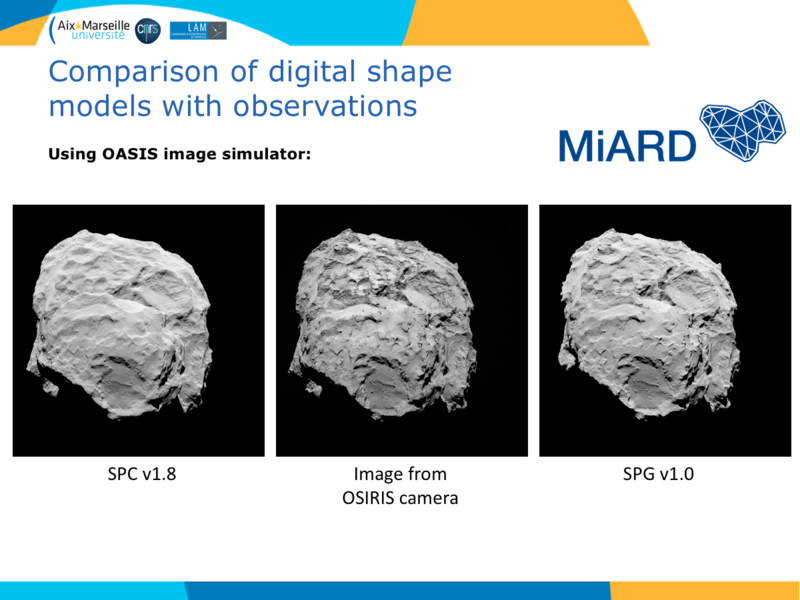 The MiARD project partners at the Laboratoire d’Astrophysique de Marseille have been developing both qualitative and quantitative methods to compare the quality of shape models (digital terrain models) of the comet 67P/Churyumove-Gerasimenko. The image below shows two different provisional digital models of the comet (on the left the shape derived from stereo photoclinometry, on the right the shape derived from stereo photogrammetry). The centre image was obtained by the OSIRIS narrow angle camera on board the Rosetta spacecraft. These different images can be compared by eye to give a qualitative idea of the agreement. The datasets can be further processed to quantify the detail agreement (e.g. by looking at where edges are detected). It should be noted that these small images do not give a true idea of the complexity and resolution of the datasets. ESA’s blog about the Rosetta mission recently highlighted the cometary ‘zoo’ of different kinds of gas molecules that have been detected by the mass spectrometers of the University of Bern’s ‘Rosina’ instrument on the Rosetta spacecraft. In this tongue-in-cheek way of presenting complex chemical concepts, several groups of similar chemicals have been identified and associated with an animal to make them easier to remember.